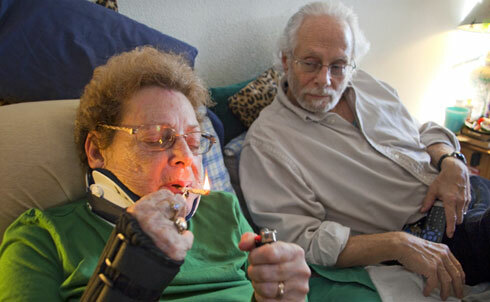 The biggest users of our medical system are senior citizens, and it should therefore come as no surprise that when medical marijuana first became available in California, seniors were some of the first to try it out. 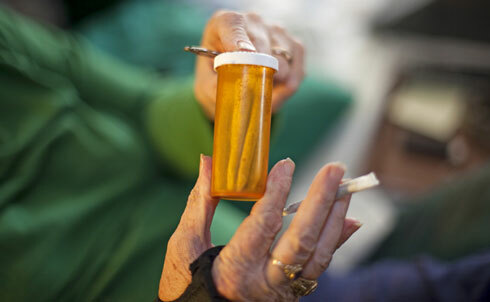 Seniors are finding that medical marijuana works on a large variety of illnesses that modern medicine has yet to effectively treat. They claim it’s effective for everything from asthma to the recurrence of polio. However, being legal and effective doesn’t make it any less controversial. 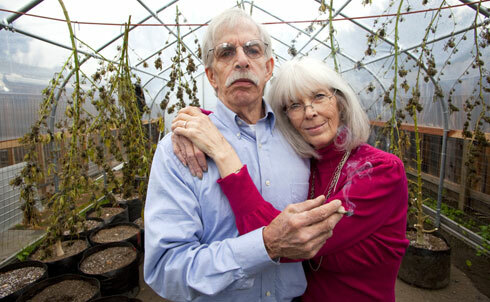 Seeing a grandparent smoking marijuana can be a shock. Chris Hermes of Americans for Safe Access says that 50 percent of medical marijuana users are over the age of 50 and fifteen states currently have medical marijuana laws. 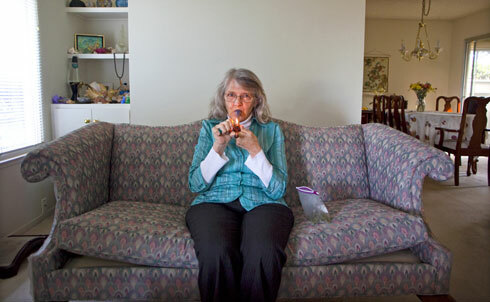 In the images that follow, by photographer Steve LaBadessa, meet the seniors who use medical marijuana and read them explain, in their own words, why they rely on it to lead pain-free and productive lives. When I was much younger I had a terrible migraine headache and on a lark someone gave me some marijuana. It went away and I was laughing and having fun. As it wore off the headache came back. Now, I have fibromyalgia. I have a drawer full of pain pills the doctors gave me. They turned me into a zombie. Medical marijuana is so much better. There are so many different kinds of marijuana; you find the kind that suits you. My family says, “There goes Pat doing her thing again.” With my daughter early on I told her there are certain drugs that were OK and certain ones to stay away from. I recognized it as a kind of a rite of passage for a young person. I think marijuana is perfectly safe. I was diagnosed with multiple sclerosis at age 36. The MS drugs they have are for younger people. Over 50 years old, they don’t work the way they should. The biggest issue is the nasty muscle spasms in the arms and legs. I have spasms internally as well. For the MS I had to take this drug Neurontin, which made me feel like I was underwater. I had to take larger and larger doses to do the simplest things. I couldn’t live that way anymore, so I stopped. I was using marijuana at the time and I noticed when I didn’t smoke the pain returned. I don’t sit in a hole and float away listening to music. It’s for my health and life. I’m so glad to be able to use it. It has enabled me to live a normal life. I’m not a person who sits at home. I’m out there living a life. I’ve had chronic back pain since 1997. That’s when I started using cannabis. It relaxes the spasms in my back. I tried other medications and I was slurring my words, they totally spaced me out. I couldn’t drive my car even with a small dose. 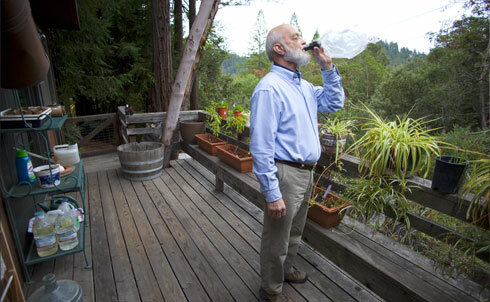 I can be clear and functional with cannabis. I ingest using suckers. It works deeper on my muscles. I medicate four times a day with the same sucker. I can stand in line at Safeway now. I had experienced so much pain before I had to lean on things. I have a very active lifestyle now, I do a lot of dancing, yoga every day, walking and swimming. There are fifty or sixty different active components in cannabis. THC is the famous one. It’s also the most mentally stimulating one. Other components are muscle relaxants and pain relaxants. They don’t stimulate your mind that much. You don’t take them to get high. You want a more productive day. Different varieties of cannabis have different components and different effects. I have scoliosis. It can be managed with prescription drugs or it can be managed with cannabis with far fewer side effects. I do a combination of both. I make a real effort to minimize prescription drugs because they’re toxic. I started using cannabis medically when I became more educated about it. The more I learned about it, the more I thought, “This just really makes sense.” I’m a nurse, I have some idea of how medications work. It’s about the safest drug you can take. I suffered from chronic obstructive pulmonary disease, COPD. It was hard for me to breathe. My doctor gave me an inhaler. That worked at first. Then he gave me another inhaler. I went through inhaler after inhaler. I was still having difficulty breathing. Then one morning I misplaced my inhaler. A week later I noticed I was breathing better. (I had started taking cannabis). 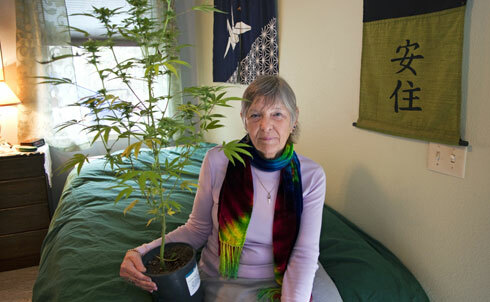 I realized that the cannabis was a better medicine for me. I did some research on the Internet. I found out about different ways to ingest it. I discovered a volcano, a vaporizer. It’s wonderful. It lets me breathe deeper, it does what an inhaler should do. My family thinks I’m a little wacky, but they understand that I’m improving. They’ve always been against marijuana. They want to turn their backs to it. My dad was a Pentecostal minister in Wisconsin, so when I first went to the dispensary I felt guilty. I bought into the negative hype of reefer madness, that you shouldn’t smoke pot. I had this debate in my head about all this weird stuff that I heard from when I was a kid. I had no expectations, but much to my surprise, it worked. I played a lot of sports, football in college. I have a reconstructed right knee. I also have no cartilage in my left knee. The cannabis works like a lubricant for my knees. In the morning I eat it in a brownie or in my coffee. In the evening I smoke it before I go to sleep. I had polio in 1952. I had paralysis and was in an iron lung. I was subsequently cured but the symptoms came back in 1992. My muscles would cramp and release, it was twenty-four hours a day. It’s called vacillation. I volunteered for experimental antispasmodic drugs. At one point I was taking eighteen pills a day. They ended up damaging my pancreas. I started using cannabis because it was the only thing I’ve tried that doesn’t affect the rest of my system. It’s a very effective release of that muscular pain. My primary physician at Kaiser authorized my use of cannabis. She’s enthusiastic about my use of it. I’ve done this with the knowledge, consent and advice of my doctors. They see the results. For more from The Nation on the drug war, view the slide show From Prohibition to Prop 19. The NationTwitterFounded by abolitionists in 1865, The Nation has chronicled the breadth and depth of political and cultural life, from the debut of the telegraph to the rise of Twitter, serving as a critical, independent, and progressive voice in American journalism. Steve LaBadessaPhotographer Steve LaBadessa lives in Oakland, California. For 10 years he was a contributing photographer to People magazine. 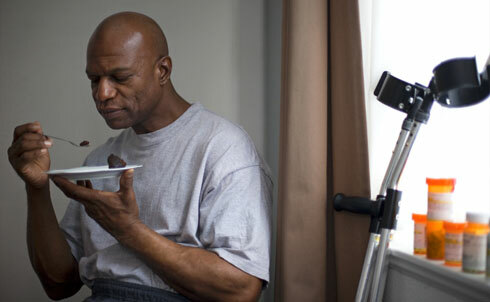 His work has also appeared in Time magazine, TV Guide and The New York Times Magazine among other publications. He has shot advertising projects for Discovery Communications, Johnson & Johnson and Lexus. His work can be seen at stevelabadessa.com. Want to Expand Medicare? Then Answer the $5 Trillion Questions.